در خلیج فارس حدود 90 جزیره کوچک و بزرگ وجود دارد که 34 جزیره آن متعلق به ایران است. از این تعداد 17 جزیره از نظر حاکمیت بر آبراه بین المللی تنگه هرمز و کنترل آن و همچنین کنترل تردد ناوگان بیگانه دارای اهمیت ژئوپلیتیکی و استراتژیکی می باشند. جزیره فارسی در مرکز خلیج فارس در مختصات َ10˚50 طول جغرافیایی و َ59 ˚27 عرض جغرافیایی، دورترین جزیره ایرانی به سرزمین اصلی می باشد. این جزیره علاوه بر اهمیت سیاسی، اقتصادی (داشتن منابع غنی نفت و گاز) و موقعیت توریسم دریایی دارای اهمیت نظامی است. موقعیت جغرافیایی جزیره فارسی باعث شده ناوگان پنجم آمریکا مستقر در بحرین، برای خروج از خلیج فارس به ناچار باید از بین دالان جزیره فارسی و ابوموسی عبور نمایند. بعلاوه، این جزیره به دلیل قرار گیری در مرکز خلیج فارس نقش مهمی در کنترل مسیر تردد کشتی ها به مقصد مناطق غرب و جنوب غرب خلیج فارس بازی می نماید. جزیره فارسی در زمان جنگ نفت کش ها موقعیت مناسبی را در خارج از تنگه هرمز برای مقابله به مثل در اختیار ایران می گذاشت. هدف این پژوهش آشنایی بیشتر با جزیره فارسی و اهمیت آن است. این جزیره از نا شناخته ترین جزایر ایران در خلیج فارس می باشد ومنابع کمی در این زمینه وجود دارد. نتایج تحقیق نشان می دهد که این جزیره به لحاظ سیاسی، اقتصادی، نظامی و قرارگیری در مسیر تردد کشتیرانی بین المللی در خلیج فارس از اهمیت استراتژیکی برخوردار است. گردآوری اطلاعات از طریق مصاحبه حضوری و منابع کتابخانه ای انجام شده است واز نظر روش، ماهیتی توصیفی و تحلیلی دارد. همچنین برای آماده سازی نقشه ها از نرم افزار فتوشاپ استفاده شده است. There are about 90 large and small islands in the Persian Gulf, of which 34 belong to Iran. 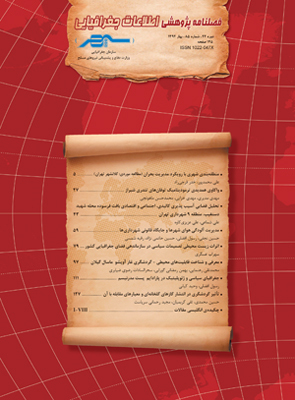 Of these, 17 islands have geopolitical and strategic importance in terms of sovereignty overthe international waterway of Strait of Hormuz and its control,as well as controlling of the foreign fleet traffic. The Farsi Island located at the center of the Persian Gulf,atlatitude 27° 59' 36" N and longitude 50° 10' 22" E,is the farthest Iranian island to the mainland,and Arabi Island (Arabic Island) of Saudi Arabia is the nearest island to it.In addition to its politicaland economic importance (having rich oil and gas resources) and its position of maritime tourism, the island is of military importance. The geographical location of the Farsi Island has forced the Fifth Fleet of the United States, based in Bahrain, to inevitably passbetweenFarsi and Abu Musa Islands. Furthermore, due to its location in the Persian Gulf, the Farsi Island plays an important role in controlling the traffic route of the ships to the western and southwestern regions of the Persian Gulf. Farsi Island provided Iran with a good position during the Tanker Warto strike back outside the Strait of Hormuz.The aim of this research is to become more familiar with Farsi Island and its importance. The island is one of the most unknown islands in the Persian Gulf and there are few sources in this area. The results of the research show that the island is strategically important in terms of political, economic, military, and its location at the international shipping route in the Persian Gulf. The information was collected through interviews and library resources, and the methodology has a descriptive - analytical nature. Photoshop software was also used to prepare the maps. The island is strategically important due to its location at the shipping route.